“This is a Wales Theatre Awards first” says Lowri Haf Cooke. Indeed it is. She is on the Taliesin stage for Best Male Performance in the Welsh Language. Llion Williams steps forward for his role in Theatr Genedlaethol's epic “Chwalfa”. It is a first since he has been on the stage not long before for his role in “Belonging/ Perthyn.” If speeches are to be made then they should be made the Llion Williams' way. His self-description is “It's that strange man from North Wales” and he has a lovely phrase “I speak two spokes”. But he makes a point too of gravity. Art is a skein that links past and present; to live wholly within an unlit presentness is a prison cell. The strikers of Penrhyn, says Llion Williams, were there in spirit with us every night in Pontio. They are not the only ones to be remembered. Hijinx are on tour but they send a video message from Hull- even Fred gets in his irreverent word or two. But the comedy apart the company pays tribute to one of their co-devisers, Martin Vick. Likewise when “Kommilitonen!” receives its award tribute is given to Peter Maxwell Davies. The Wales Theatre Awards event is itself manifestation of the chain of art that links across the decades. Mike Smith and Suzanne Murphy give joint tributes to the winner of a Special Award. That Dennis O'Neill has been wholly unaware that it is due is remarkable. That it is also his birthday is a happy bonus that earns a standing audience and a grand “Penblwydd hapus” in chorus. His is not the only birthday. Peter Doran is not on hand to receive his Best Director award. A parental birthday has taken precedence. His message is given by a representative from Re-Live. “Belonging/ Perthyn” made a deep impact on its audiences but it made itself felt, says Doran, also on its makers. It is a fact of life, and a good one too, that on a Saturday night some award-winners are going to be away doing what they do. The Hijinx group are in the City of Culture. Sophie Melville is on video in close-up at the Orange Tree in Richmond (the reviews for Claire McIntyre's “Low Level Panic” are brilliant.) Gwyn Hughes Jones is back-stage at Covent Garden. He and Bryn Terfel are in heavy costume for Wagner. In a nice touch touch of art-meets-life Bryn hands him the medal that is the prize in “Meistersinger”. Gwyn Hughes Jones has something important to say. “I'm a product of my community and it's important to invest in our communities.” Matthew Bulgo on stage says that it was his first stage. Had he not been there in the 1990s in a youth company he would not be there today. The recipient of the award for “Y Chwalfa” insists, rightly, that she be joined by the company. One of them, when I first sighted him, was a twelve year old doing the tech for a Christmas show in a Memorial Hall. Instantaneous achievement is a cultural myth. Mike Smith takes to the platform to announce an initiative to locate young writers on the arts in the Communities First areas of Wales. 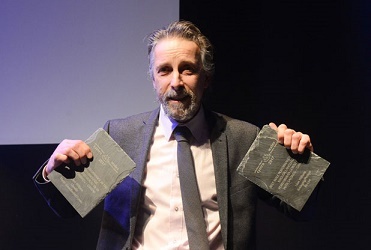 No-one would disagree with Jeremy Turner's comment on receiving his award for “Cysgu'n Brysur” that “we need more dialogue in the arts.” Mike Smith interviews three of his new reviewers as to what attracts them to live performance. “You can see people fly” says Rhydian sagely. You can see more of course but no-one ever bought a ticket for a sociology treatise or to be lectured or to be chided for being so unsatisfactorily passive. Rhydian may be young but he's got it: performance lives because you really can see people fly. The Awards have matured with experience into a smooth production. (A declaration of interest: I am one of the forty reviewers but saw only eight of the 2016 nominated forty-one productions. Hindsight tells all-“Belonging/ Perthyn” did Pembrokeshire and Powys but not Ceredigion). Michael Sheen is author of the programme's foreword. The programme on the way in lists the nominees, a second version on the way out contains the winners. This is attention to fine detail. The presenters keep it going at a good pace. The links between live presentation and video are seamless. The technical team at Taliesin have done a good job. In return the Taliesin bar seems to be doing very nicely. The artistic community brought together likes to talk but it likes to lubricate its talk as well.